The products keep coming. The latest announcement from Samsung is a new addition to its ATIV range and it's a hybrid in more ways than one. Similar to the ASUS Transformer Book Trio, announced earlier this month at Computex, Samsung just introduced its own dual-OS portable. It's called the ATIV Q, and it combines Android 4.2 and Windows 8. Under the hood, the device is powered by a Haswell-series Intel Core i5 processor and manages to fit a 13.3-inch, 3,200 x 1,800 touchscreen into a 1.29kg package that measures just 13.9mm thick. Other notable specs include an S Pen with 1,024 degrees of sensitivity. There's space for the stylus to be stored in the bottom corner of the device. Hardware considerations have also been folded into the design, with the processor housed inside the ATIV Q's hinge. Samsung says that this ensures that heat dissipates from the back of the device. A software highlight from this particular Windows 8-Android team-up is the ability to share files (photos, documents... seemingly anything that can be opened with programs on the other OS) and share folders across the operating system divide. We can certainly see the usefulness in this approach -- sharing images to your favorite Android social app and generally unifying how you use the hybrid, regardless of OS. The ATIV Q will launch globally in Q3, and we've been told "in time for the back-to-school season", which sounds like sooner rather than later. We've managed to spend a bit of time with the new multi-talented slider: check out some first impressions after the break. Update: We just added some video. We immediately noticed the resolution bump provided by the Q's display. Samsung's new qHD+ panel ensures there are a whole lot of pixels on that 13.3-inch screen. The inclusion of Intel's new Haswell processors also means we're expecting battery life to power through a respectable number of hours, regardless of the new power-hungry display, though we'll have to wait for review models to arrive before we can confirm this. Samsung says that the ATIV Q actually has four driving options. Tablet and typing are the two fundamental ones, of course, but you can add to that a floating mode (for stand-up typists: the screen remains parallel to the keyboard, and you type beneath), as well as a stand option, where you can flip the screen at right angles to the keyboard, displaying Windows or Android to someone seated opposite of you. The screen automatically flips to ensure your audience is looking at your all-important spreadsheets -- or cat GIFs -- right side up. The hinge felt rigid enough and there's access to a microSD slot within it. Given the size of the device, the choice to go with a mouse nub over a trackpad is understandable, if slightly disappointing. This editor prefers his Windows 8 machines with a decent trackpad and while the touchscreen should ameliorate a lot of gesture issues, we'd still prefer to have the option there. 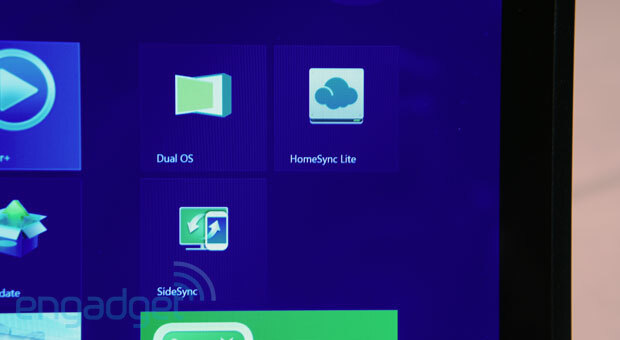 Flipping between Windows and Android is effortless, with an onscreen tile on the desktop OS and a launch app on Google's mobile interface. We particularly liked the ability to transplant apps from the Android menu to our Windows tile collection -- there's a shortcut above the app menu when you select something from it. Dropping it on top will install it to Windows 8's Modern UI, and when we tapped to launch within Windows, it went straight into the app. There's no need to switch to Android in between. The company's apparently worked hard to offer a very similar user experience to its Galaxy Tab range and our experience agreed with that -- it felt like a slightly thick Android tablet when we were swiping around the web, menus or obligatory rounds of Angry Birds. (There's also a built-in accelerometer for tilt-to-steer games). However, running on just a single Haswell processor (rather than splitting up the workload, as seen on the Transformer Book Trio) we're wondering how long the ATIV Q will run on the more lightweight workload of Android. Despite that, Samsung continues to work on its knack for mashing-up gadgets and we can't help but be intrigued by this one.